Classic Carpet One in Shelby Township, MI offers unique window treatments options! Classic Carpet One in Shelby Township, Michigan works hard to create an overall, unique experience for our customers. You shopping experience involves everything you need from flooring to window shades! We have many different styles available from clean and simplistic to elaborate, motorized window treatments. With Hunter Douglas, your search for the right window fashions is over! Designed keeping technology, safety, privacy, style, and efficiency in mind, has resulted in a truly, custom built window covering for your home or office windows. We recommend checking out our samples in-store and we're here to provide our expertise! 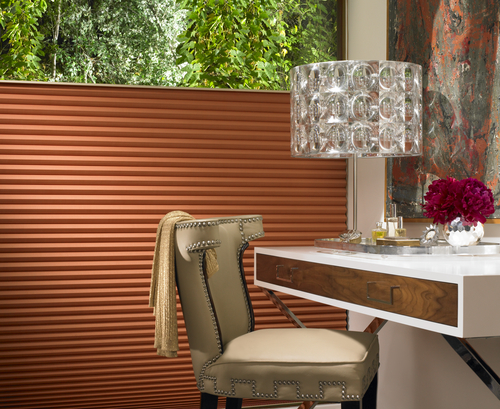 Hunter Douglas has been an industry leader for an mastered the art of window dressing for 30 plus years. All products are made within the U.S and materials used are high-quality, creative fabrics with real linen weaves. Products range from sheers, roman, roller and cellular shades, shutters, horitzontal and vertical blinds, and wooden blinds. 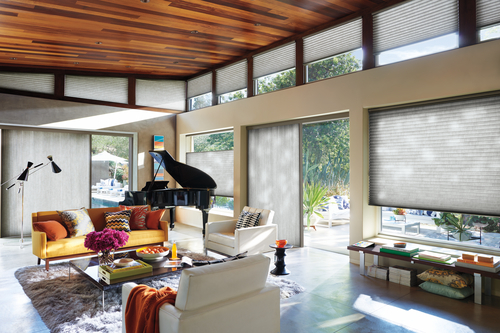 As a result, Hunter Douglas window fashions offer form and function in any home or business setting. While some designs are simple in nature, others can seem quite complex; however, all Hunter Douglas products are easy to use and make for seemless day to day light control. Incorporating these shades in any space helps to protect furniture and flooring from harmful UV damage, ultimately preventing fading. We are so sure that you will love your Hunter Douglas window treatments that we even provide a lifetime guarantee! What is the point of purchasing beautiful shades if they do not serve a function? Thankfully, Hunter Douglas ensures that each window shade design offers up several different benefits and features to make this product worth your consideration. From standard window measurments to obscure, large window expanses, Hunter Douglas has options for every situation. Products are built to control natural sunlight by diffusing harsh light, redirecting it, and bringing it deeper within your desired space. Other advantages included cordless wand options as well as motorized, retractable lifts for high, ceiling windows. Again, all products are designed with intent and purpose so these are built with children's safety in mind. Tip for the day, 50% of lost heat comes from your windows! Many people consider replacing home windows to better insulate their house; however, there are other, less costly options to prevent heat or cool air from escaping your environment! There are select products that are most known for their cellular design construction that help create a pocket of air, preventing air from circulating through. Common products are Duette, Vignette, Solera and Honeycomb Shades. Receive up to $200 in rebates!